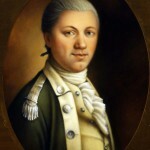 Samuel Nicholas was appointed by Congress as a captain for the new Marines on November, 28, 1775. His commission was signed by John Hancock, president of the Continental Congress. Born in Philadelphia around 1744, Nicholas was educated at the Academy of Philadelphia (forerunner of the University of Pennsylvania). At the time of his commissioning, Nicholas was proprietor of the Conestoga Wagon Inn. 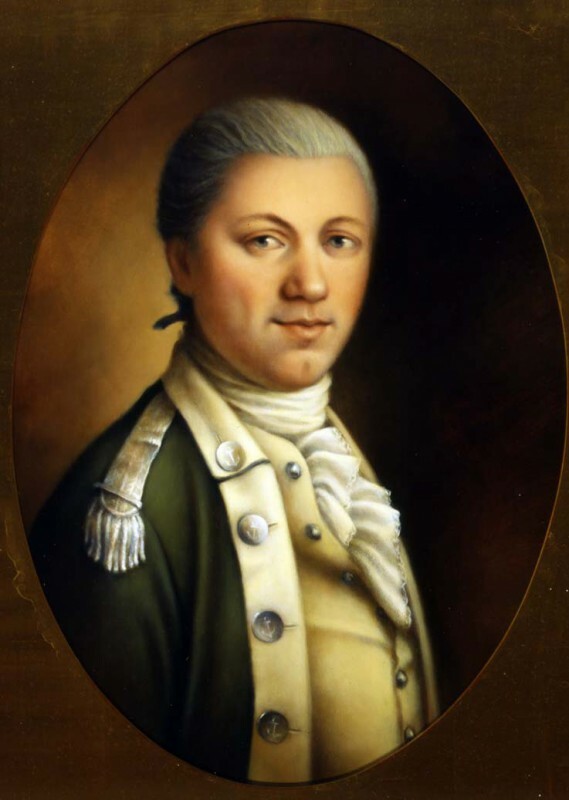 In late 1776, Samuel Nicholas was promoted to major. He led a battalion of Marines as part of General George Washington’s Continental Army. He and his Marines participated in the Second Battle of Trenton and the Battle of Princeton and encamped with the army at Morristown for the remainder of the winter. For the rest of the war, Nicholas performed administrative functions for the Continental Marines. For that reason and by virtue of holding the highest rank in the Continental Marines, he is considered to be the first commandant of the Marine Corps. In the 1970s the construction of Interstate 95 destroyed the historical marker as the site of Tun Tavern was buried under the new highway. In 2005, a new historical marker was placed along Front Street between Chestnut and Walnut Streets, near the site of the tavern. Tun Tavern is depicted on a memorial marking the arrival of Scots immigrants near the original site of the tavern. The memorial was placed by the St. Andrews Society of Philadelphia, which was founded in 1747 at Tun Tavern. 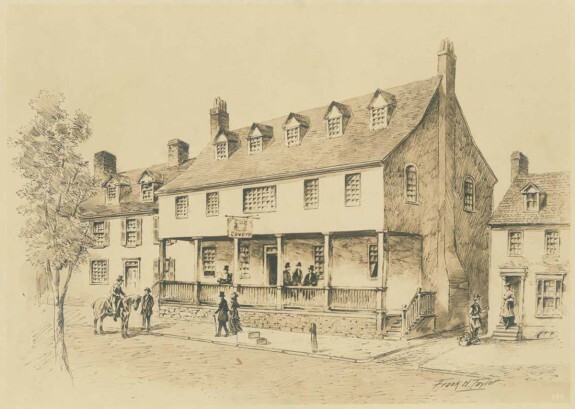 For nearly a hundred years from 1693 to 1781, Tun Tavern served residents and visitors of Philadelphia near the Delaware River waterfront with food, spirits, and sociability. Also a meeting place for social and military organizations, Tun Tavern is best remembered as the “birthplace” of the United States Marine Corps. Its patrons included such noteworthy Americans as Benjamin Franklin (1706-90), John Adams (1735-1826), and two of the first Marine officers: Samuel Nicholas (1744-90) and Robert Mullan. Founded at the corner of Water Street and Tun Alley by Joshua Carpenter in 1693, the three-story Tun Tavern derived its name from the Old English word “Tun” for keg or barrel of beer. Conveniently located near Philadelphia’s riverfront wharves, Tun Tavern became popular among seafarers and others who supported the city’s maritime industry. Over the years, Tun Tavern played host to groups such as the St. George’s Society, which assisted needy Englishmen arriving in Pennsylvania, and the St. Andrew’s Society, which aided needy Scots. St. John’s Lodge No. 1 of the Grand Lodge of the Masonic Temple held its first meetings at Tun Tavern in 1732. In the 1740s, proprietors Thomas and Margaret “Peg” Mullan added “Peggy Mullan’s Red Hot Beef Steak Club” to the tavern’s name. Tun Tavern’s first associations with American defense occurred in the decades prior to the American Revolution. 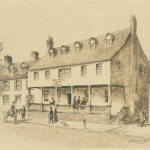 In 1756, with Pennsylvania colonists in conflict with Native Americans on the frontier, Benjamin Franklin used Tun Tavern as a recruiting point for the Pennsylvania Militia. Beginning in the fall of 1775, the Naval Committee of the Continental Congress, whose members included John Adams, met several times at Tun Tavern to discuss naval and maritime affairs and plan operations for the fledgling Continental Navy. The tavern gained its status as “birthplace” of the Marine Corps because of its role in recruiting the American colonies’ first Continental Marines, which the Continental Congress authorized on November 10, 1775. As captain for the new Marines, Congress appointed Samuel Nicholas, proprietor of the Conestoga Wagon Inn. Nicholas in turn called upon his friend Robert Mullan, the son of Thomas and Peg Mullan and co-proprietor of Tun Tavern, for assistance in recruiting men to serve. Robert Mullan, commissioned as a first lieutenant, logically selected his place of business as the Marines’ recruiting station. Although Congress authorized two full battalions of Marines, no formal battalions were ever established but provisional units were established as needed. 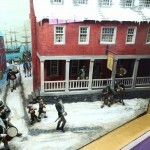 The first Marines recruited for service at Tun Tavern were intended to support a naval expedition to Nova Scotia. However, their mission was changed to raiding the Bahamas Islands to capture weapons, supplies, and munitions from British garrisons. Under the command of Commodore Esek Hopkins (1718-1802), this expedition consisted of eight hastily armed and equipped ships and approximately 250 Marines, including Nicholas and Mullan. After departing Delaware Bay in February 1776, in March the expedition conducted an amphibious assault on New Providence Island in the British Bahamas. Under the command of Nicholas, 220 Marines and sailors captured Forts Nassau and Montague, Nassau’s Government House, and the town of Nassau. They occupied New Providence Island for two weeks and then withdrew, taking with them a great quantity of munitions and guns desperately needed by George Washington’s Continental Army. Nicholas and his Marines later participated with the Continental Army in the Second Battle of Trenton, the Battle of Princeton, and the winter encampment at Morristown. Tun Tavern continued to serve as a recruitment station for Continental Marines throughout the War for Independence. 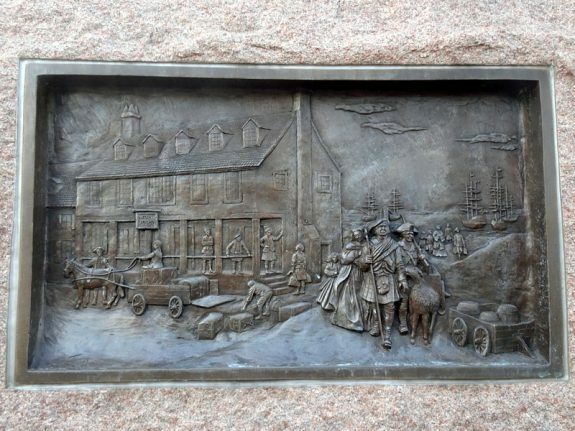 Although destroyed in a fire in 1781, the same year that the British surrendered to the Americans at Yorktown, the tavern continued to be remembered as “Birthplace of the Marine Corps.” In the 1920s, a commemorative plaque marking the site and its significance to the Marines was placed on the Merchants Warehouse, a massive building constructed around 1905 on the block bounded by Chestnut Street, Delaware [now Columbus] Avenue, Water Street, and Walnut Street. Construction of Interstate 95 in the 1970s destroyed the Merchants Warehouse and left the site of Tun Tavern buried beneath the highway just south of the Benjamin Franklin Bridge. In the mid-1970s, the Marine Corps Reserve Officers Association and the Marine Corps Memorial Foundation proposed building a reproduction of Tun Tavern in a park at Penn’s Landing near the original site, but the plan never came to fruition. 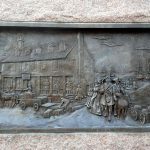 Philadelphia lacked a marker for the site of Tun Tavern until November 10, 2005–the 230th birthday of the Marine Corps–when the Pennsylvania Historical and Museum Commission dedicated a new marker on Front Street between Chestnut and Walnut Streets. Over the years, Tun Tavern has been commemorated in various ways. Atlantic City boasts the Tun Tavern Restaurant and Brewery. The National Museum of the Marine Corps in Triangle, Virginia, near Quantico, includes a reproduction of Tun Tavern that sells food and spirits. 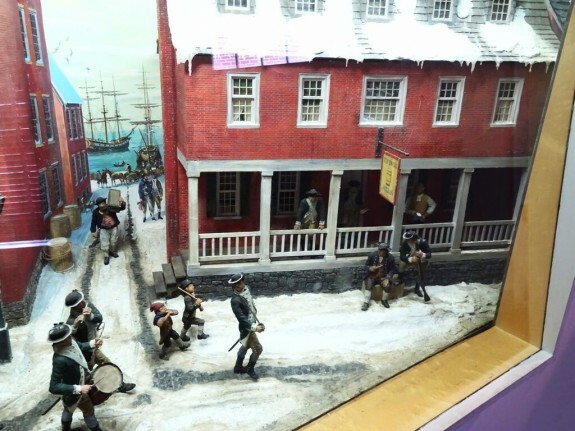 The New Hall Military Museum of Independence National Historical Park includes a diorama depicting Tun Tavern. Although the original site of Tun Tavern lies buried beneath Interstate 95, its legacy lives on as the “birthplace” of the U.S. Marine Corps. Bryan J. Dickerson is a military historian from Gloucester County, New Jersey. He holds a B.A. in History from Rowan University and an M.A. in American History from Monmouth University. He is a Navy veteran of Operation Iraqi Freedom who deployed twice as a member of the 2nd Marine Aircraft Wing. Bertollet, Edwin F. “New Warehouse Construction in Philadelphia.” Fireproof Magazine. (June 1905), pp.273-6. Hicks, Norman W. Major, USMC. A Brief History of the United States Marine Corps. In the series Marine Corps Historical Reference Series. Washington, D.C.: Historical Branch, G-3 Division, Headquarters, U.S. Marine Corps, 1961. McClellan, Edwin N. Major, USMC. History of the United States Marine Corps. Vol I of II. Washington, D.C.: Historical Section, U.S. Marine Corps, 1925. McGrath, Tim. Give Me a Fast Ship: The Continental Navy and America’s Revolution at Sea. New York: Penguin, 2014. Newland, Samuel J. The Pennsylvania Militia: Defending the Commonwealth and The Nation, 1669-1870. Harrisburg: Commonwealth of Pennsylvania Department of Military and Veterans Affairs, 2002. Parker, William D. Captain, USMCR. A Concise History of the United States Marine Corps 1775 – 1969. Washington D.C.: Historical Division, Headquarters, United States Marine Corps, 1970. Philadelphia: A Guide to the Nation’s Birthplace. Harrisburg: Pennsylvania Historical Commission, 1937. (Republished as The WPA Guide to Philadelphia. University of Pennsylvania Press, 1988). Smith, Charles R. Marines in the Revolution: A History of the Continental Marines in The American Revolution 1775-1783. Washington D.C.: History and Museums Division, Headquarters, U.S. Marine Corps, 1975. “Tun Tavern Reconstruction.” Fortitudine. (Newsletter of the Marine Corps Historical Program). (Winter 1974-75), Pp. 17-18. Tun Tavern Historical Marker, Front Street between Chestnut and Walnut Streets, Philadelphia. I’m working on digging up my family history and am interested in learning the names of the early Marines from Tun and shortly after. Maybe early enlistment records? My family has a very long and large history in early America. We are direct descendants of Revolutionary War participants, Henry Adams (an original settler to Massachusetts – so obviously this wouldn’t be for him, but I wanted to see if any names matched his decedents. Henry is my 10th great grandfather and his daughter, Frances is my 8th great grandmother. ), Captain Samuel Stalnaker (my 7th great grandfather), Wilhelmus William Westfall (my 5th great grandfather), David Frame (6th great grandfather) of VA, Joseph Balliet (my 6th great grandfather) of PA and Rev. John Kell(e)y (my 5th great grandfather) of VA. I only have DNA confirmation on Westfall, Stalnaker and Adams and the others are lineage records at this point. I have been using ancestry.com along with my DNA for all my referencing at this point and will begin with Wiki soon. Fold3.com has not been too beneficial excluding one relative from 1812 (Henry Barton SC -he looks to have been killed during the war or died shortly after due to his wife remarrying after his death and signing off on her widow benefits from the Government). I cannot find more information about his involvement or his lineage. I am hoping to see if any information you can provide member wise of the original Marines will add to my family’s legacy story. I am the mother of a Marine Pvt and big sister to a Gunnery Sergeant in the USMC (19 years in the Corps). My grandfather Served proudly as a USMC Sgt during WWII in the Pacific (Hubert John Westfall) and my father Served in the USAF in Germany during Vietnam as a Sgt. My husband is an Army Veteran and currently a 22 year veteran of a major mid western city police department. I also have two stepsons in ROTC Army and Air Force college programs. Our military history is important to me. Thank you so much for your time and if you need any more information from me such as dob’s or dod’s, please let me know. I appreciate any information you can share with me.